Hoteliers are increasingly aware of the need to maximize revenue by driving quality traffic to their website in a results-driven and cost-effective manner. 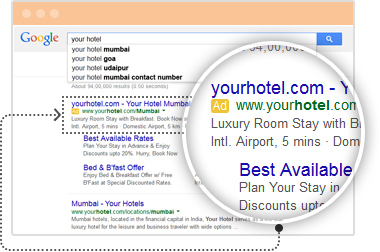 Expand your hotel's visibility and reach and increase your revenue by proficiently managing targeted search marketing campaigns, as well as implementing comprehensive inbound marketing strategies tying together SEO, PPC, social media, and branded content with the range of ResAvenue hospitality marketing solutions. These days internet has added a new dimension to the intense competition in the hospitality industry. Today, one in every two rooms is booked via the Internet. Given this, you know you have to have an attractive website and make your rooms available online, don't you?The first key to converting a direct booking is your hotel's online brand presence. ResAvenue's web design and development team works with you to build an elegant, dynamic and user-friendly hotel website that strategically converts lookers into bookers and increases conversions. Websites are nowbeing accessed through variety of channels like desktops, mobile phones and tablets. Because we know how integral tablets and mobile devices are to today's travel experience, responsive design for your hotel website is not an option, it's a must. At ResAvenue, we specialize in responsive hotel website design that translates and functions beautifully across browsers and devices. Investing in good responsive hotel website design helps enhance your conversion rates and ensures a much smoother user experience. In today's competitive market Search Engine Optimization (SEO) is more important than ever. 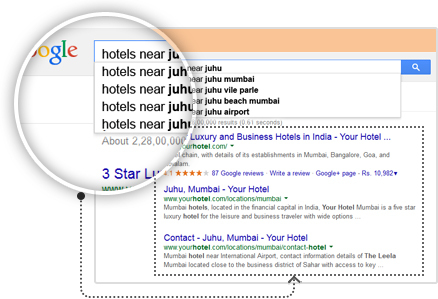 If a customer is looking for hotel options on search engines and you don't show up, you don't exist. SEO is what increases your chances of being found on search engines. ResAvenue works with you to draw traffic to your site organically by optimizing your current website to comply with Google's best practices for higher search engine ranking across the major search engines.Additionally, we also develop an ongoing SEO strategy that analyzes your traffic and keyword rankings, and make recommendations on how you can implement SEO for these keywords andimprove constantly. Pay-per-click marketing is a way of using search engine advertising to generate clicks to your website, rather than "earning" those clicks organically.ResAvenue's pay-per-click marketing and management solution helps your hotel increase interested traffic through geo-targeted, cost-effective and ad scheduling campaigns. We closely monitor your PPC campaigns to ensure that you are allocating your budgets strategically and generating leads at a competitive ROI (Return on Investment). Our in-house expertise ensures your campaigns are targeted, affordable, and accountable, offering valuable brand-building opportunities and amazing returns on advertising spends. One of the best ways to convert visitors into customers is by providing them a true-to-life presentation, that gives them a clear view of your hotel premises even before they make a booking. ResAvenue in association with Cybervox Network Limited presents virtual reality solution which can present your hotel infrastructure and facilities to visitors in an aesthetic, realistic yet innovative manner, far beyond just static images. 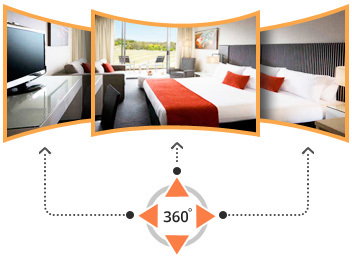 Unlike traditional photography, which offers only one angle of image, Virtual Reality promises full 360Â°view that increases audience engagement with 'just-right' media intelligence and personalized solution.They can virtually visit, feel and examine the interior, exterior and other facilities offered by your hotel, motivating them to take a quick decision and finalize booking with confidence. A powerful and versatile platform for social engagement, online brand marketing and performance analytics. It gives you a clear and comprehensive picture of the overall health of your online business as well as the visibility of your hotel on leading Social Networks. You can view feedbacks, engage with your fans on social media and monitor your online reputation. A great platform to monetize on your brand presence and reputation to the fullest!